Search is constantly evolving space, over 500 search algorithm changes were made in the last year. As such, it's important to stay abreast to the changes in search, and to understsand the strategies from leading brands and agencies. 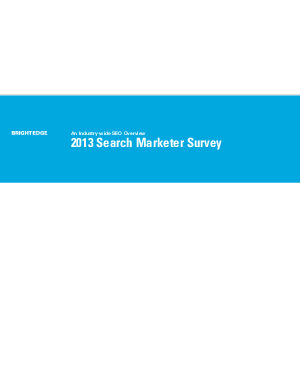 BrightEdge's 2013 Search Marketer Survey, offers guidance on how leaders continue to stay ahead in the search marketing industry. Find out what top digital marketers are thinking about leading trends in search and SEO.